Is water becoming increasingly scarce? If recent usage trends continue, many people believe that shortages are inevitable. Aquanomics comprehensively examines the full range of water problems and reveals measures that should be implemented to avoid the onset of possible water crises. These policies include establishing secure and transferable private water rights and extending these rights to uses that traditionally have not been allowed, including altering in-stream flows and ecosystem operations. The authors argue that such policies will help maximize water quantity and quality even if water becomes scarcer and more valuable. Mark Twain once quipped, Whiskey is for drinkin, water is for fightin over. However, the authors of Aquanomics now provide proven solutions to such potential conflicts by establishing the validity of market-based approaches. Water quality can be improved by allowing the trading of water-quality permits (and of wastewater-discharge permits) to operate more like a real market. Markets for water quality reduce water pollution by lowering the cost of pollution abatement. Unfortunately, water-quality trading, as usually proposed and practiced under the Clean Water Act, has only a limited number of real market-like features, and this limitation prevents permit trading from living up to its full potential. Some of the hindrances are high brokerages fees set by government agencies, extra costs due to unattractive trading rules, and a lack of marketplace information as to what abatement is worth to buyers and sellers of credit. Government wildlife agencies and environmental groups are increasingly purchasing water rights, an activity that was once the exclusive domain of agricultural, industrial, and municipal water users. From 1987 to 2007, more than 2,500 transactions involving so-called instream rights were completed, with total expenditures exceeding $530 million (adjusted for inflation). Colorados state Water Conservation Board has created nearly 1,500 new instream rights on over 8,600 miles of streams and water levels on 482 lakes. Arizona, Idaho, Nevada, Oregon, and Wyoming also permit new appropriations for certain instream purposes. Auctions for water rights are improving Oregons Deschutes River Basin and would enhance other watersheds. Auctions are a promising device because they give the owners of water rights and mitigation credits an opportunity to offer their assets for an acceptable price as changing uses are facilitated. They are especially important instruments for generating and revealing information as to what water is worth to people who buy and sell in actual markets. The enforcement of water rights and contracts in the United States has weakened. Some of the reasons are changes to federal and state laws, the expanding public-trust doctrine in the courts, and the assertions of new stakeholder rights. These trends are often accommodated by the failure of regulators and conservationists to see how a market-based system of water rights can reduce waste and pollution, and enhance water flow, water quality, and ecosystem management. Dam removal has been proposed as a way to reduce the risks to life and property from the possibility of dam failures and to restore damaged river ecosystems. With about 79,000 relatively large dams in the United States that pose high or significant risks in the event of failure, dam removal would be a huge and controversial undertaking. One example of the possibilities and difficulties of decommissioning dams is the September 2009 agreement to remove four dams on the Klamath River, beginning in 2020. The tentative agreement was reached by 28 different groups and took ten years to achieve. The agreement calls for three years of study and then a final decision by the U.S. Department of the Interior, assuming all of the parties sign off on the final agreement. How will Californians decide the fate of their most important freshwater resource? The troubled SacramentoSan Joaquin River Delta ecosystem has long been the subject of bitter dispute between agricultural interests, urban water users, taxpayers, environmentalists, and various in-Delta interests. The most politically feasible approach to shoring up the Delta and better managing its water exports is probably to build a dual-conveyance system that would export water through both the Delta and a canal that bypasses it. Is water facing a crisis? Yes and no. On the one hand, declining water quality is a serious problem in many parts of the world; and if recent usage trends continue, shortages are inevitable. On the other hand, water quality has improved in many economically advanced countries, and in some regions institutions and policies have been adopted that would postpone, or even avoid, the onset of water crises. These policies include establishing secure and transferable water rights and extending these rights to enhance ecosystems. 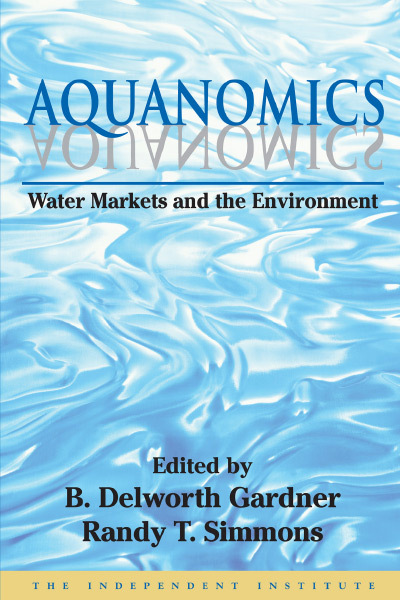 Aquanomics: Water Markets and the Environment, edited by B. Delworth Gardner and Randy T. Simmons, discusses many examples of such policiesparticularly water markets and market-like exchangesand makes recommendations designed to improve their effectiveness. Reforms that incorporate private-property rights in water and emerging water markets, the editors argue, would help maximize water quantity and quality as water becomes scarcer and more valuable. These measures would also accommodate changing and often conflicting demands for water, including increasingly valuable conservation and environmental uses. With its thorough analysis of existing water markets and its bold exploration of the potential for private-property rights to enhance freshwater ecosystems, Aquanomics will quench the thirst of readers eager for fresh insights about the worlds most vital natural resource. Markets for freshwater ecosystem servicesfor wetlands, streams, nonpoint source water pollutants, and habitat conservationare developing across the United States. In chapter 2, Martin W. Doyle and Todd BenDor provide a comprehensive review of this trend. Of course, poorly structured state and federal policies can undermine ecosystem mitigation efforts. In addition, the tensions between local and federal policies will remain an on-going problem. But so long as scientific monitoring is used to evaluate a programs success, Doyle and BenDor expect markets for ecosystem services to continue to play an important role in freshwater ecological restoration. Until recently, nearly the entire burden of pollution control has been placed upon point sources (mostly industrial and municipal). Nonpoint sources (mostly agricultural) are regulated on a voluntary basis. A farmer, for example, may voluntarily elect to use less fertilizer or reduce pollution-generating production. For these actions the farmer may receive credits commensurate with the amount of pollution reduction. Farmers who can abate pollution at lower costs may sell these credits to those whose costs are higher. In chapter 3, Jeffrey M. Peterson and Craig M. Smith describe the extent of these pollution-abatement markets and the major impediments to their further utilization. Chapter 4, by Brandon Scarborough, looks at the purchase of water for the environment. Scarborough provides a state-by-state account of recent legislation that permits market-water exchanges where instream demanders such as wildlife agencies and conservation groups are increasingly participating in these exchanges. He also suggests ways to eliminate the remaining impediments to instream transfers. Giving instream uses the same legal standing that traditional diversion enjoys would help water markets develop and would require that instream rights be clearly defined and enforced. How do auctions for water rights promote environmental amenities? In chapter 5, Ray Hartwell and Bruce Aylward explain how various types of auctions can provide increased stream flows to accommodate instream uses and also to provide mitigation credits when pumping reduces groundwater supplies. Various types of auctions are evaluated in terms of their suitability, particularly in thin markets where the numbers of buyers and sellers are limited. Water markets in the American West display an apparent paradox: unlike commodities in conventional markets, increases in the demand for water for higher-valued uses has not brought forth comparable increases in supplies from lower-valued uses. Why? In chapter 6, Stephen N. Bretsen and Peter J. Hill argue that multiple rights to veto water transfers has hampered the transfer of water from lower-valued agricultural uses to higher-valued industrial and municipal uses. This problem is made worse when exclusion rights and use rights are not bundled together for all rights holders. The high likelihood of lawsuits to invalidate water transferseven after they have been contracted foralso raises the cost of potential transfers and undermines economic efficiency. Another obstacle to water markets is the evolving public-trust doctrine. What began as a legal principle to protect a public right to access to waters for the purposes of navigation and fishing has evolved into a doctrine that accommodates public rights to almost every conceivable interest in water. As James L. Huffman explains in chapter 7, this development has opened the floodgates of access so widely that few private rights are left. But if every self-identified stakeholder can legally protest water transfers, then parties who have entered into contracts for water rights cannot depend on getting what they have contracted for. This uncertainty discourages the development of water markets. Water-quality trading, as usually proposed and practiced under the Clean Water Act, falls short of a real market in water quality management. In chapter 8, Leonard Shabman and Kurt Stephenson and explain why market-like approaches should be preferred to the mere trading of effluent permits for wastewater discharge. They also suggest ways to add market-like properties to water-quality management within the existing statutory and regulatory requirements of the Clean Water Act. In many Western states, public water districts rely on property taxes to fund the payment of water developers such as the federal Bureau of Reclamation. But this kind of tax produces an implicit subsidy to water users because it is unrelated to the quantity of water demanded. Would direct water charges (prices) be a politically and economically feasible alternative? Drawing on data from Utah, B. Delworth Gardener shows in chapter 9 that higher water prices would induce sufficient water conservation so as to preclude the need for many new water projects that are economically infeasible and environmentally harmful. Changing to a pricing system that permits the elimination of property taxes would require some modifications of existing water contracts with the Bureau, but this does not appear to be an insurmountable obstacle once the economic and environment benefits are apparent. The decommissioning of dams seems to be a growing worldwide concern. Unfortunately, decision-makers will be tempted to set priorities for dam removals solely on the basis of political pressures, without consideration for cost, ecological effects, and stakeholder preferences. In chapter 10, Pearl Q. Zheng, Benjamin F. Hobbs, and Joseph F. Koonce provide an evaluative framework for dam decommissioning that considers these crucial elements. They apply their framework to two case studiesa single dam near Lake Erie and a portfolio of dams in the same area. Among other conclusions, they find that an analysis of a series of dam removals might make more sense than considering them one at a time because for some purposes (such as removing barriers to fish migrations) the dams are interdependent. Three chapters focus on water issues in California, a hotbed of recent controversy and path-breaking legislation. One major dispute surrounds the future of the SacramentoSan Joaquin River Deltaa vast network of waterways that is home to endangered species, a destination for recreation, and a source of water for Central and Southern California. In chapter 11, Rachael E. Goodhue, Susan Stratton Sayre, and Leo K. Simon evaluate the political feasibility of the alternative solutions to this dilemma as seen by various stakeholder groups that are affected by the Delta water exports. Their rigorous analytical framework incorporates key physical and biological relationships that determine stakeholder groups welfare under each proposed solution. They conclude that the most politically feasible alternative is to build a canal and export water both through the canal and through the Delta (a so-called dual-conveyance system). In chapter 12, Brian C. Steed describes the development of groundwater governance in the Los Angeles Basin and the consequences of the unpredictability of surface water supplies even as the region continues to grow and water demand increases. Because of these uncertainties, Californias evolving water markets are falling far short of their potential. Still, one of Steeds most important conclusions is that as the property rights in groundwater became clear through basin adjudications, extensive water market transfers emerged that have facilitated more efficient use and conservation of this crucial resource. Richard W. Wahl has been at the center of debates over water rights and markets since the early 1980s. In the books final chapter, Wahl describes the history and types of water rights in California and the rise of market transfers as catalysts for change. Although he focuses on the Golden State, his discussion applies to the entire region. Among other important recommendations, Wahl calls for the replacement of riparian water rights with a permit system that should facilitate market transfers to higher-valued uses. "Understanding the institutions that govern water use, including how they create and solve problems, is critical for ensuring there is enough water, of sufficient quality, to meet human needs in the future. The superb work in Aquanomics represents an important step toward understanding those institutions, drawing on history, economics, and law to show how water institutions actually work."